For a number of years BHW has been partnering with Samuel Thang. He is a pastor and leader and cares for many vulnerable children with his wife Mercy. 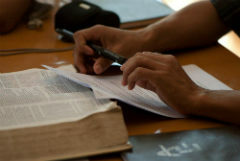 The first thing we did with Samuel and Mercy was to assist them to establish an internet cafe for use by the community. The purpose was to assist them to become self-sustaining to care for all the children they were caring for at the Peace Children's Home. This quickly became successful and almost immediately they began to make profit. With the profit they built a chicken egg laying project with 500 chickens. 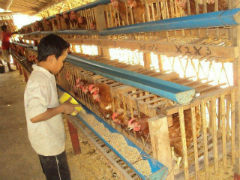 This too became successful and another 400 chickens were added to the project. This demonstrated to us that they understand the issues of running a business and have the ability to be flexible. There are many aspects of business that are out of the control of the small business owner / operator. So, when they came to us in 2011 proposing the establishment of a micro-loan programme we were interested. In December 2011 a training course was run and since then ongoing discussions have been underway working out the details of the development. Ongoing research and development of the concept has also continued to the point it is ready to start as a pilot programme. 1) The first will be a group of church pastors who will be the guinea pigs so to speak. It's so hard to know what will happen until the funds arrive so the first group will be a control to iron out the issues. 2) The second group are the older children leaving the Peace Children's Home. Many of the young people cannot get worthwhile employment after finishing school so they want to assist them to start their own small businesses. A number of opportunities exist for the children. 3) The third group will be poor rural Christians in the north of the country. The key people are still being identified but the needs are huge in rural villages. An initial group has been identified. The proven calibre of the leaders of this programme is the strength of this. There are also some very disadvantaged people in the network Samuel is leading. Samuel Thang is the founder of Peace Children's Home and oversees all the children as well as being responsible for the finances. He is married to Mercy and they have two daughters - Biak Hlei Par and Boih Boih. Samuel graduated with degrees from Myanmar Bible Institute in 2000 and South India Baptist Bible College and Seminary in 2002. From 2003-2009 he taught at Restoration Bible Institute and now is a full time minister at Hmawbi Christian Church in addition to overseeing the Peace Children's Home. The vision is to empower some existing ministers economically so they are able to sustain their families. This is a pilot programme and if successful, the programme will be extended to some rural areas, particularly focused on the poor. The budget is $US4,400 for a period of 3 years. This programme is still waiting to commence but a number of proposals have been received. One is from a missionary in a rural village called Sen Phong. He wants to purchase many types of grain during the harvest period and store them. Then, as the price increases, he would sell the grain and make a profit. The profit from this business will be used to assist with church planting in the village, to help him care for his and other poor children, 13 of them, and also to help with support for his family including his aged mother. The amount requested is around $US4,400, however it would start smaller than that and grow from year to year. Other proposals have been received based around farming, small shops and a building supply shop.